A multi-vitamin and mineral formula that REALLY feeds your cells! 48 bio-available nutrients for cell health and longevity! Contains nutrients in the most bio-available forms for optimum absorption! Economical formula for the entire family! Remember the good old days when your grandparents could go out on the farm or to a local grocery stand to get fresh, natural foods LOADED with nutrients? They didn’t need vitamins and minerals - their foods were rich in nutrients! Proteins in wheat and barley have declined by nearly 50%! Newer crops of corn now contain less protein, oil and amino acids! Most wheat contains 6 fewer minerals than in your grandparents’ day! USDA reports calcium content in broccoli dropped over 65% - from 12.9 mg to 4.4mg! Farmers increase yield of raspberries with phosphorous fertilizer - but that crop can be deficient in minerals by as much as 50%! Mineral deficiencies in the soil - create inferior products lacking essential nutrients! Environmental pollution - contaminates our food sources from seed to harvested product! Modern farming methods - using pesticides, herbicides, chemical fertilizers and other harsh chemicals deplete the natural nutrients in foods! Antibiotics and other drugs injected in livestock - means humans are also ingesting these drugs with every bite! Transportation and storage - causes fruits and vegetables to be deprived of natural sunlight… picked too soon... and then artificially ripened while stored in trucks, ships and planes! So is a multi-vitamin the answer? Yes - and no! If you think a run-of-the-mill multi-vitamin will give you the nutritional boost you need to enhance your health - think again! 48 bio-available nutrients - ready to optimize cell health! Unlike regular, mass-produced multi-vitamins - you get much more than the basic vitamin and mineral mix. With Multi-Xtra - you get the critical co-factors that are necessary for optimum absorption of nutrients! Without these co-factors - such as Piperine to improve bio-availability of nutrients - your body simply can’t absorb the nutrients properly. But don’t worry - it’s all in Multi-Xtra! Naturally sourced nutrients - not synthetic! Many multi-vitamins cut costs by giving you synthetic vitamins that your body can’t utilize properly. Take for example, Vitamin E. Research shows that Vitamin E - in its natural form - contains a synergistic balance of both Tocopherols and Tocotrienols. However, the common Vitamin E used in most multi-vitamins - contains only one of these compounds - Alpha-Tocopherol. Protect your heart and arteries! Suppress C-Reactive protein - an important inflammation marker! Support healthy levels of dangerous blood fats called triglycerides! By providing you with only one of the powerful forms of Vitamin E you need - can you see how regular multi-vitamins are simply not getting the job done to protect your health? With Multi-Xtra - you get the right natural nutrients your body needs for healthy performance! A solid foundation for your health! If you don’t always eat well - you can rest assured you’re getting the important vitamins and minerals your body needs every day! Multi-Xtra is like a little “health insurance” to assist your body dealing with the effects of a nutritionally deficient diet! … Multi-Xtra is formulated for men and women - making this an economical and affordable way to enhance the health of every family member! Please note: If you’re currently taking any of the Total Balance complete nutrient formulas found in the Core Wellness Activators - you do NOT need to take Multi-Xtra! To learn more about Core Wellness Activators click here. Other Ingredients: Microcrystalline Cellulose, Dextrose, Clear Glaze (Talc, Polyvinyl Alcohol, Polyethylene Glycol and Polysorbate 80), Silicon Dioxide, Sodium Carboxymethyl Cellulose, Maltodextrin. Daily serving: Men or women from the age of 12 years - 2 tablets. Take both tablets in one dose, with or after food. Combines well with our Omega 3 Fish Oil products and Kiwi-Klenz for optimum general health. 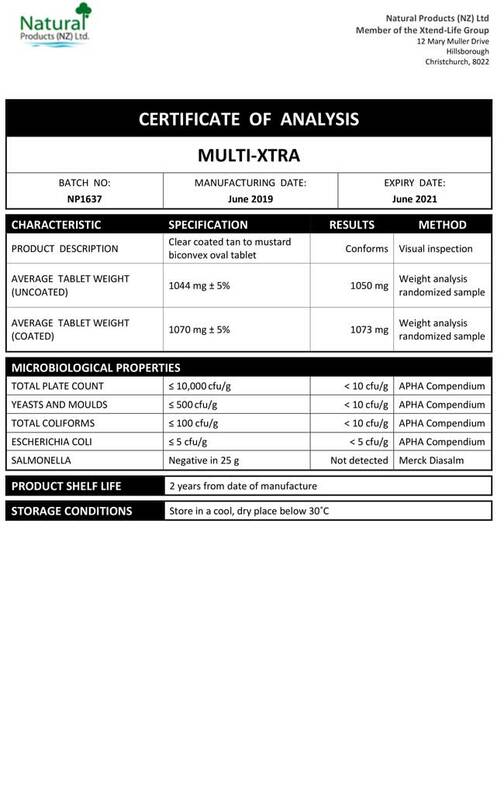 We have included below a copy of a typical Certificate of Analysis (CoA) for our Multi-Xtra product. Please note that we produce our Multi-Xtra products regularly throughout the year. You can be assured that every bottle, from every batch will meet these exceptional standards, and it will be from a current, recently produced batch. You will note that there are two columns which are headed 'Specification' and 'Results' respectively. The specifications are simply our minimum standard to which each batch of Xtend-Life Multi-Xtra has to conform, otherwise we would not release it. The results are the actual results from the independent laboratory that did the testing. What are the main benefits of Xtend-Life Multi-Xtra? Multi-Xtra was developed to cater for those customers who are for whatever reason not using Total Balance. Multi-Xtra is one of the very few 'complete' multivitamins on the market today. Multi-Xtra provides a broad spectrum of the best forms of essential nutrients at a low cost. There are many health benefits which can be experienced from taking Multi-Xtra, such as increased immunity, improved skin and nails, increased energy levels, heart health support and overall improved health and wellbeing. You can feel confident that your cells and organs are getting the benefit even if you don't feel any immediate difference. The nutrients are doing their job at a cellular level in the body so you may be totally unaware of their actions. How does Xtend-Life Multi-Xtra compare with other multivitamin products on the market? The biggest differences are in the form of vitamins used. For example, we use only the best natural forms of ingredients. These are the most expensive forms but they provide the best efficacy. They are 'grown' rather than being a derivative of petrochemicals. This is often not the case with lesser priced, mass produced multivitamins. For instance, the Vitamin B2 in Multi-Xtra is a special form known as Riboflavin-5-Phosphate which is around 10 times as expensive as the ordinary B2. Does Multi-Xtra have an enteric coating? No, Multi-Xtra does not have an enteric coating. The enteric coating is not needed for this, as there are no sensitive ingredients such as SAMe which need to be protected so they aren't destroyed by the stomach acid during absorption. Our Total Balance is enteric coated, as this range contains sensitive ingredients. How is Total Balance different to Multi-Xtra? Multi-Xtra contains a variety of vitamins and minerals which are great for supporting immunity, supporting skin and nails, increasing energy levels and supporting general health. Multi-Xtra is one of the very few 'complete' multi's on the market today. Multi-Xtra provides a broad spectrum of the best forms of essential nutrients at a low cost. Our Total Balance range contains many of the same ingredients as Multi-Xtra, but it has the added benefits of a higher proportion of antioxidants and age defying ingredients. Total Balance, is a complete nutrient system containing a variety of vitamins, minerals, an enzyme blend, an eye health blend, an amino-acid blend and natural hormone balancing extracts. It is beneficial, in supporting overall health and wellbeing by reducing free radicals in the body, supporting immunity, increasing energy levels and naturally supporting the balance of hormones in the body, plus much more. Will Multi-Xtra help with allergies such as hay fever and pollen? Many allergies are thought to be brought on by multiple factors including nutrient deficiencies. The nutrients in Multi-Xtra will help to resolve nutrient deficiencies, however there is no guarantee this will help with allergies. Can I take Multi-Xtra if I have a shrimp or shellfish allergy? There are no shellfish derived ingredients in Multi-Xtra. However, if you are highly sensitive to sulfur-containing substances (sulfonamides or sulfites) you may wish to consult with your doctor before taking Multi-Xtra as MSM (methylsulfonyl methane) is one of the ingredients. Is Multi-Xtra suitable for vegetarians? Can I give Multi-Xtra to my teenager or child? Yes, Multi-Xtra is suitable for children and teenagers from the age of thirteen years old. We would recommend taking two tablets per day. For children under the age of twelve years old, we recommend taking our Total Balance Children's which is specially formulated with their needs in mind. Can you tell me more about the ingredients in Multi-Xtra? Full information on our ingredients can be found on the Multi-Xtra 'Ingredients' page. They all have their individual benefits, but only when formulated together in specific quantities and ratios is it possible for them to achieve optimum results for long-term health and wellness. When combined synergistically, studies have shown that the effectiveness of nutrients can be greatly increased. What else can I do to enhance the benefits of taking Multi-Xtra? For maximum benefits and to reach optimum health it is always important to combine a generally healthy lifestyle with any supplement regime. Even moderate exercise is proven to be beneficial to our immune system, heart, muscles, circulation, joints and reproductive system. A healthy and balanced diet of complete vitamins, minerals, essential enzymes, amino acids and trace elements is also essential and will help to keep your heart healthy and enhance your overall health.